Composed by Anton Pann by Gheorghe Ucenescu. Arranged by Keith Terrett. World, European, Patriotic. Score, Set of Parts. 10 pages. Published by Casio (S0.118203). An arrangement of the Romanian National Anthem Deșteaptă-te, române! 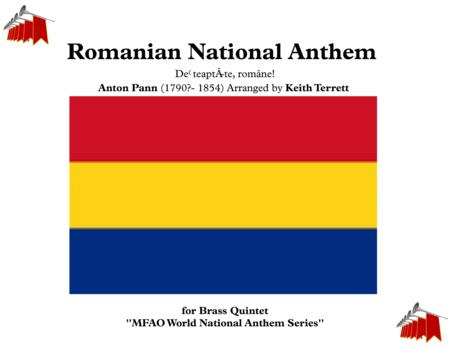 for Brass Quintet.Written during the 1848 revolution by Andrei Mureşianu and set to the music of Anton Pann by Gheorghe Ucenescu and originally titled “Un răsunet” (An Echo), the poem’s theme of revolution, liberty, and patriotism, quickly became popular with Romanians, especially in subsequent national struggles, earning the song the nickname of the “Romanian Marseillaise“. It was first used as a national anthem by the short-lived Moldavian Democratic Republic in 1917-1918 (and was the first anthem in use by independent Moldova from 1991-1994) and was long regarded as an unofficial Romanian anthem. It was heard frequently during the protests against the communist government in late 1989 and was officially confirmed as the national anthem in the spring of 1990. The original work has eleven verses, but only four (verses 1, 2, 4, and 11) are usually performed as the official lyrics (although on special occasions, such as National Anthem Day (July 29, the anniversary of its first performance in 1848), the full lyrics can sometimes be heard).For more of my original music, great arrangements and all the national anthems of the world, check out my on-line stores:http://www.scoreexchange.com/profiles/keith_terrethttp://musicforalloccasions.org.ukhttp://www.sheetmusicplus.com/search?Ntt=keith+terrettNeed an anthem fast? They are ALL in my store!All my anthem arrangements are also available for Orchestra, Recorders, Saxophones, Wind, Brass and Flexible band. If you need an anthem urgently for an instrumentation not in my store, let me know via e-mail, and I will arrange it for you FOC if possible! keithterrett@gmail.com.